As part of the government programme, AKHS is supporting 18 health facilities in Rushan District, Tajikistan. Effective training of hospital staff remains a priority for Aga Khan Health Services (AKHS) as part of an effort to improve managerial and medical practices - Khorog General Hospital, Tajikistan. At the AKF / AKHS medical point in Shidz,Tajikistan, a pregnant woman is answering a nurse's questions. Family health services provided by AKHS in Badakhshan, Afghanistan. Healthcare provision in Tajikistan has less to do with a shortage of facilities than with the need to rationalise the existing system and to improve quality. The health status of the populations in Afghanistan is poor. After more than 20 years of war, the health infrastructure by the time of AKDN’s entry in 2002 was negligible. AKDN’s response in the health sector in Afghanistan so far has been a mix and match from its experience in Northern Pakistan and Tajikistan. In addition, the Ministry of Health in Afghanistan, supported by UN organisations, donors and NGOs including AKHS and AKF has formulated over the last years a strategy which includes a basic package of core services, that any agency wishing to provide health services to Afghans must deliver first before adding any other services. At level 1, volunteer male and female community health workers (CHWs) are trained, supervised and given basic provisions by the AKDN and remunerated by the communities served. At levels 2 and 3, Basic Health Centres (BHC) provide for out-patient care, immunisations, normal deliveries, supervision of village-based community care with a recommended coverage at minimum of 10,000 people, and Comprehensive Health Centres (CHC) provides in addition to BHC complete obstetrical care coverage, emergency surgery, and have limited inpatient capacity; recommended coverage at minimum of 25,000 people are constructed or rehabilitated, managed and operated by AKDN on land donated by the communities to the Ministry of Health. 29 BHCs and 6 CHCs are now operational in the provinces of Badakshan, Baghlan, and Bamyan as well as the district hospital in Baharak, and the provincial hospitals in Bamyan and Feyzabad. In the catchment areas of the health centres a health post is located in every village, and each health post is staffed by two CHWs- one male and one female. With these twenty-three facilities and trained CHWs in all villages a basic essential healthcare provision infrastructure is put in place for 400,000 people. Per capita payment arrangements with the government are the current policy direction in Afghanistan and allow AKDN to partly share the costs of service provision. The health programme in the Kyrgyz Republic aim to enhance the health status of communities in the remote, mountainous regions of the country by improving access to quality health care at the local level and advancing health promotion, with a special focus on women of reproductive age and children under five. The main strategic directions of the health programme include community health promotion, capacity building of health professionals as well as health promoters, and strengthening health service delivery. The village community of Shipad, Rushan District, with assistance from MSDSP, rehabilitated this medical point in Shipad Village. As part of the government programme, AKHS is supporting 18 health facilities in Rushan District. The combination of the break-up of the Soviet Union and stopping of subsidies, and the civil war of 1992-1997 hit especially the geographical area of Gorno-Badakshan, where AKDN started its health activities in 1997. Health services, previously relatively generously financed had virtually no budget anymore. Moscow had invested heavily in the area and developed extensive health and education systems but at the same time, the society had become deeply dependent on Moscow for strategic direction and even survival. The 1990s saw a worsening of the health indicators, with a decline in life expectancy and increases in maternal and child mortality. The hospitals and health centres deteriorated, with buildings not repaired and much medical equipment unusable due to lack of spare parts, and no drugs or supplies. 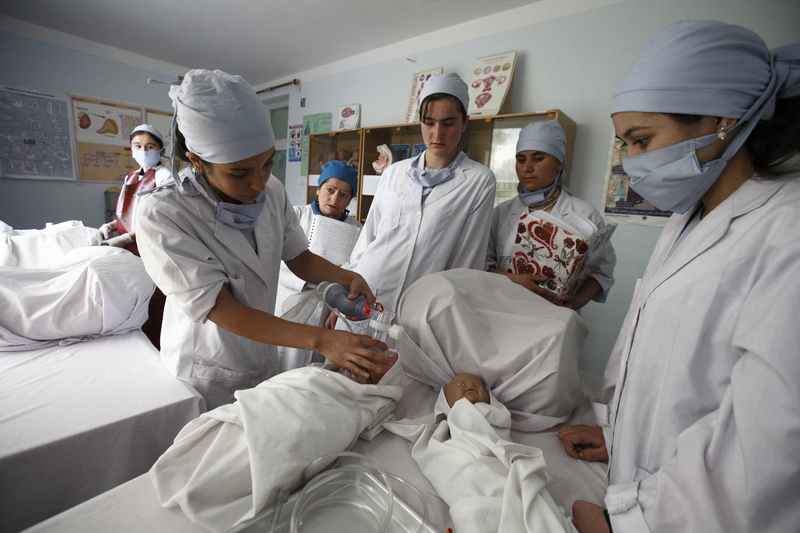 To achieve its vision of a sustainable, cost-effective health system accessible to all, Tajikistan's reform priorities include implementing effective public health measures; enhancing primary care; reducing duplication and increasing efficiency in the hospital system; building the capacity of the health professionals; and involving the community in developing and governing the system. The issue for AKDN has been how to support the system in a situation where reform is the priority. Contrary to Northern Pakistan where AKDN had operated almost in exclusion of government policies and systems, the strategy in Gorno-Badakshan has been to work very closely with the government, given its pronounced presence, to help tune its capacities to a new situation and to support the system towards reform with the aim to improve access to quality of care and at the same time pay attention to financial sustainability. The Aga Khan Health Services (AKHS) has implemented, with support from AKF and international donor agencies, the active participation of the communities and in partnership with the Department of Health (DoH) of Gorno-Badakshan, a wide range of interventions in health promotion, facility rehabilitation and equipping, pharmaceutical procurement, distribution and sales, and training in new clinical and managerial practices. Special attention is being given to "professionalising" nursing and family medicine. All the programmatic interventions are designed to protect and promote the health status of the most vulnerable in Tajik society, i.e., women of reproductive age and children under five years of age, and to encourage the health ministry, within the oblast with its population of 220,000 that is directly targeted with this set of interventions, and throughout Tajikistan, to shift from a focus on curative care provided in general and specialised hospitals to an emphasis on primary and family care supported by facility-based services. Making use of this experience, AKHS is now expanding its community health programme into other geographical areas of the country, Katlon and Rasht. In a public-private partnership arrangement, AKHS is also managing the upgraded diagnostic services in the Khorog Oblast General Hospital.